Japanese scientists have produced a genetically-engineered mouse that tweets like a bird, it was revealed today. The ‘tweeting’ mouse, that sings like a bird, was created as part of the University of Osaka’s ‘Evolved Mouse Project. Scientists there are breeding genetically modified mice together to deliberately get genetic mutations. ‘Mutations are the driving force of evolution. 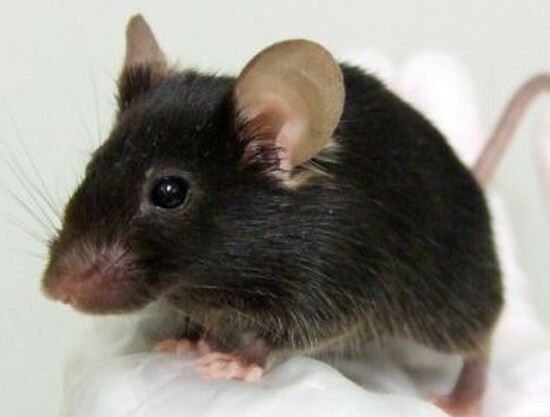 We have cross-bred the genetically modified mice for generations to see what would happen,’ lead researcher Arikuni Uchimura said. ‘We checked the newly born mice one by one… One day we found a mouse that was singing like a bird,’ he told AFP. He said that the ‘singing mouse’ was born by chance but that the trait will be passed on to future generations. ‘I was surprised because I had been expecting mice that are different in physical shape,’ he said. Watch a video of the tweeting mouse here. The project has also produced ‘a mouse with short limbs and a tail like a dachshund’. The laboratory, directed by professor Takeshi Yagi at the Osaka University’s Graduate School of Frontier Biosciences in western Japan, now has more than 100 ‘singing mice’ for further research. The team hopes they will provide clues on how human language evolved, just as researchers in other countries study songbirds such as finches to help them understand the origins of human language. ‘Mice are better than birds to study because they are mammals and much closer to humans in their brain structures and other biological aspects,’ Uchimura said. ‘We are watching how a mouse that emits new sounds would affect ordinary mice in the same group… in other words if it has social connotations,’ he said, adding that ordinary mice squeak mainly under stress. The team has found that ordinary mice that grew up with singing mice emitted fewer ultrasound squeaks than others. This could mean that communication methods can spread in the same group like a dialect. Uchimura dreams of further ‘evolution’ of mice through genetic engineering. ‘I know it’s a long shot and people would say it’s ‘too absurd’… but I’m doing this with hopes of making a Mickey Mouse some day,’ he said. I find this article unsettling that scientist are making a mouse tweet like a bird. Poor mouse.